Western blot analysis of extracts from COS cells, untransfected or transfected with GFP, using GFP (D5.1) XP® Rabbit mAb (Biotinylated). Detection was performed with streptavidin-HRP followed by LumiGLO® Reagent and Peroxidase using #7003. 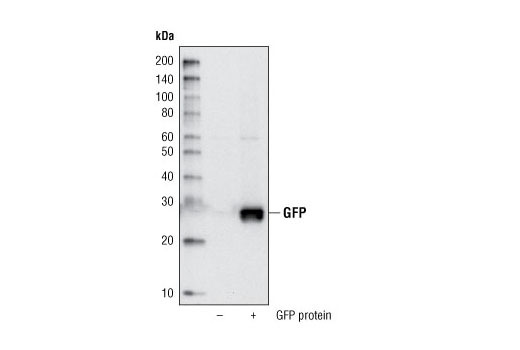 GFP (D5.1) XP® Rabbit mAb (Biotinylated) detects transfected levels of GFP or GFP-tagged proteins. Monoclonal antibody is produced by immunizing animals with a synthetic peptide corresponding to the amino terminus of GFP. The green-fluorescent protein (GFP) functions as a bioluminescence energy transfer acceptor in the jellyfish Aequorea that maximally absorbs light at 395 nm and has an emission spectrum that peaks at 509 nm. GFP has become a very useful tool as a fusion protein that reports gene expression, traces cell lineage and defines subcellular protein localization (1). Miyawaki, A. et al. (2003) Curr Opin Chem Biol 7, 557-62.